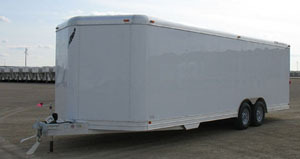 Car hauler model 4926 is shown with optional white aluminum lining, L-shaped cabinets, and plastic access door. Wall to Wall Width 92-3/8"
Fender to Fender Width 81"
Height can be raised 6″ for street car hauler with 5.5″ beavertail; Height can be lowered 2.25″ for dry freight hauler. Click for diagram.